It’s not every day that your face lands on the front cover of a magazine. I remember in high school taking photos with a film camera and sending them into Dolly Magazine. I never quite made the front cover of Dolly, but at least Miranda Kerr drew success out of it. Lol. 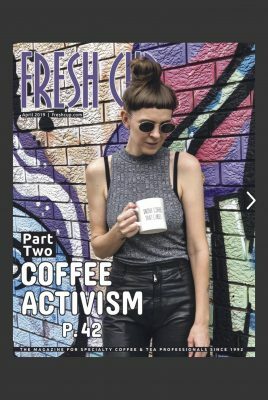 Fresh Cup Magazine, a coffee mag that’s dedicated to inspiring coffee and tea professionals, has recently written a fantastic piece on a global coffee movement that’s been developing within the industry – Coffee Activism. I was honoured to share my story with them and also happened to land my face on their front cover. I entered the coffee industry at 17, literally straight after high school. I never really thought I’d stay in coffee for long. But along with coffee’s addictive nature, I never left. I’ve had some of the best work experiences imaginable, like being paid to work on a coffee plantation and travelling the world. But, I’ve also endured some of the worst. Growing up in coffee was a confusing juxtapose. It was an industry that both brought me so much delight and disappointment. I spent a good 8 years working tirelessly to prove my worth and with a determination to not let my gender hold me back from any career opportunities. Somewhere along the way, I even resigned to the fact that I would not earn the same pay as my male counterparts and dealing with sexual harassment was simply just part of being in a male-dominated industry. I’ve had a really diverse career in coffee, working at all levels of the supply chain. However, at each level, I’ve only ever experienced male bosses. Although some of my male bosses really championed me, subliminal messaging is powerful. Over the years, my young eyes watched and came to understand that only men held senior roles on coffee plantations, only men roasted coffee, and only men owned businesses. After almost a decade of never witnessing female leadership, I believed that I, a woman, could not do these jobs. That perhaps, coffee could not offer me a longstanding career. After 8 years in coffee and with a truckload of coffee knowledge in my back pocket, I felt pretty disheartened. I was at one of those crossroads in life where my work was no longer adding value to my happiness. It was in that moment that I decided, I would either say goodbye to coffee altogether or take the plunge and start my own business. In 2012, at 25 years of age, that’s what I did. 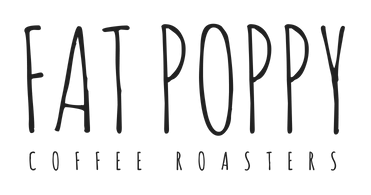 I started Fat Poppy Coffee Roasters and broke the cycle. I didn’t quite get my female leader, but I became one myself. For me, The Coffee Activism Movement is trying to rewrite this story. 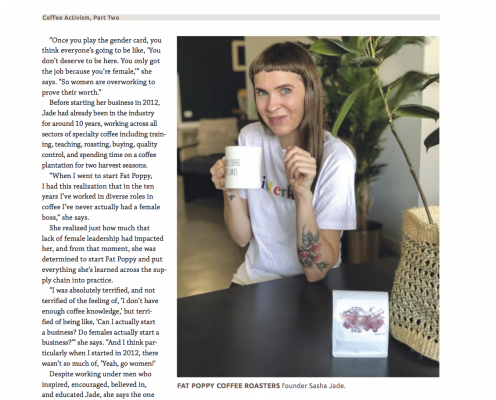 It is advocating for change, so that women believe coffee is ripe with opportunities, offering them long, prosperous careers. It is promoting fair pay, while ensuring that all women feel safe and empowered in the workplace. My overarching belief is that ‘if you can’t see it, you can’t believe it’. It is not satisfactory to tell women they can do a certain job, they need to see it and believe it with their own eyes. Female leadership at every level of the supply chain is paramount for the success of this movement. 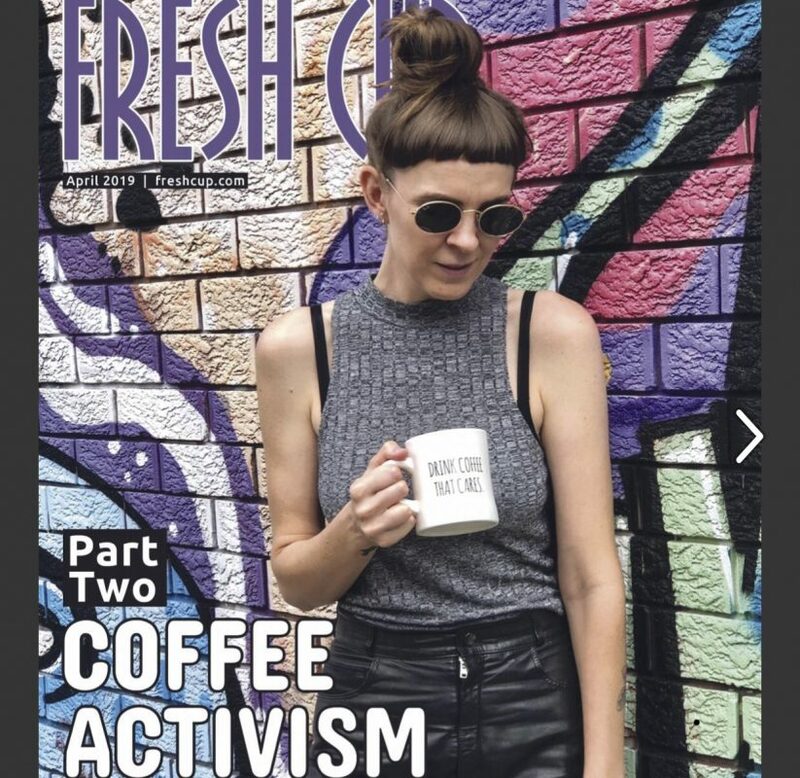 So, cheers to more women in coffee and to Fresh Cup Magazine for supporting the movement!